Mildred J. Sefton-Umsted, 95, of Vistula Road, Mishawaka, passed away at 7:00am on Tuesday, May 1st, at her home, following an illness. She was born in Indianapolis, Indiana on December 4th, 1916 to Charles and Anna (Wilson) Sheneman who preceded her in death. She was also preceded in death by her husband, Reginald and a daughter, Margaret Cole. Also preceding her in death were two stepsons, Frank Umsted and Tom Umsted. After Reginald passed away she married J. Logan Umsted in July of 1968. He died in 1981. She was a graduate of Mishawaka High School and was active in the Mishawaka Alumni Association. She worked at Uniroyal until her retirement. She volunteered at St. Joseph Hospital, Mishawaka and bowled until the age of 92. She was a former member of the Moose and loved her flower garden. She was a very loving and giving person. She is survived by her children, Patsy Meyers of Mishawaka, Wade(Jane) Sefton of Osceola and Linda(Terry) Schmidt of Osceola. Seven grandchildren, Robert Cole, Theresa Schilling, James Coryell, Gene Meyers, Gregory Meyers, Amy Fadorsen and Marcy Stanton Crum. Also surviving are twelve great grandchildren and many great great grandchildren. Also surviving are two step daughters, Sue (Bill) Dillon and Dolores (Jim) Wood. Friends will be received from 6 until 8pm on Thursday. 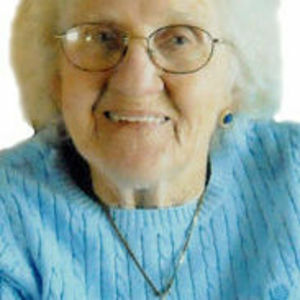 Funeral services for Mildred will be held at 10:00am on Friday at Bubb Funeral Chapel, 3910 N Main Street, Mishawaka. Officiating will be Rev. Ronald Drake. Burial will follow the funeral services Friday at Fairview Cemetery, Mishawaka. In lieu of flowers memorial contributions can be made to Hospice Foundation. The family would like to thank Hospice for all of the support and help that Hospice provided to Mildred and her family. hi marcy, do you remember me? from Liberty Mutual (sacramento, CA). I have been trying to find you on FB and your name came up under this site. Sorry to hear about your grandmother. she was only a few months older than my father! my folks have both passed on as well. Hope you are doing well and I wish God's blessings to you and your family at this time. How old is your son Tanner now?